Despite recent reports, Auburn’s Assistant City Manager says the Toomer’s Corner arch is still very much up in the air. TWER has been your number one source for Arch Talk since those disorienting Attractive Intersection Structure days of 2011. Having what “they have at Purdue” span the intersection of College and Magnolia has been on the table since the very first meetings of the Committee to Determine the Future of Rolling Toomer’s Corner. And the likelihood of the arches mentioned at pretty much every AU Toomer’s renovation workshop presentation since leaping from PowerPoint possibility to Auburn actuality seemingly increases with every official PDF. 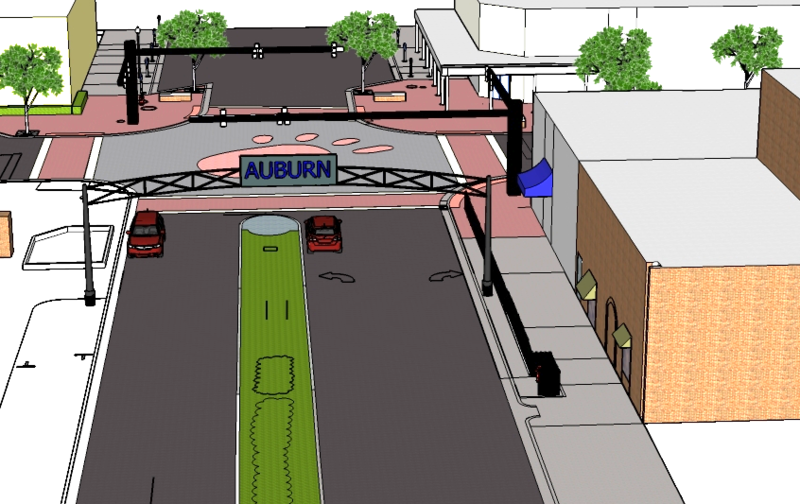 Check out the latest, but still purely conceptual blueprint for the Auburn Downtown Master Plan presented to the Auburn City Council earlier this month, and whoa, there it is: a SIM City style metal archway bearing, appropriately, the word “Auburn” rising over South College Street. 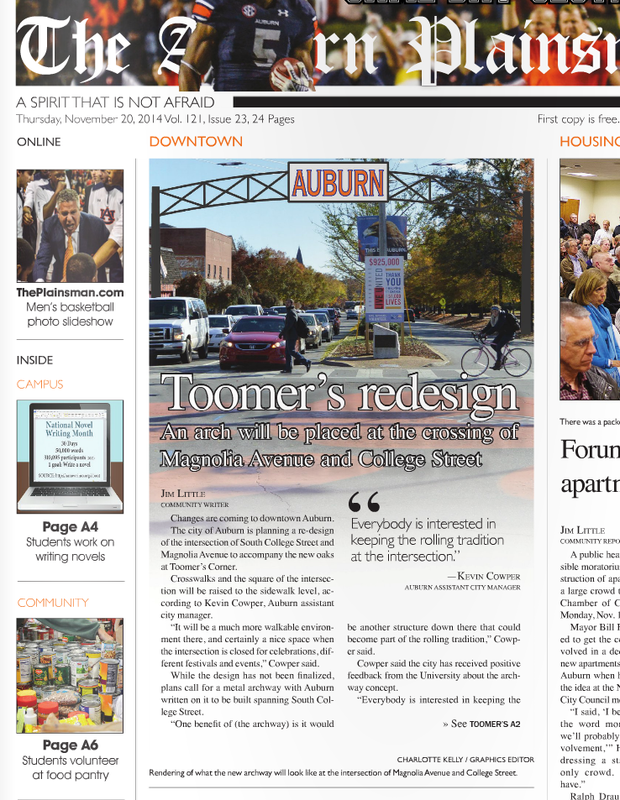 The artist’s rendering for the story on the changes coming to Toomer’s Corner on the front page of the most recent issue of the Auburn Plainsman is way more realistic. However, according to Auburn City Planner Kevin Cowper, the headline—”An arch will be placed at the crossing of Magnolia Avenue and College Street”—doesn’t exactly paint an accurate picture. The idea for an arch or arches was born back in 2011 as one of the myriad possibilities the ol’ Committee to Determine the Future of Rolling Toomer’s Corner had for continuing the tradition of rolling Toomer’s Corner that, at the time, was considered in jeopardy (though, you know, it never really was—Auburn nature finds a way). Though the committee eventually recommended planting trees to replace the Toomer’s Oaks, the arch idea, unlike other, more exotic suggestions, wasn’t completely put aside. One reason? A permanent structure downtown might keep the toilet paper from spreading further into campus (which will now be virtually impossible, arch or not). But looked is all they’ve done. No arch companies have been consulted, no final designs drawn up. 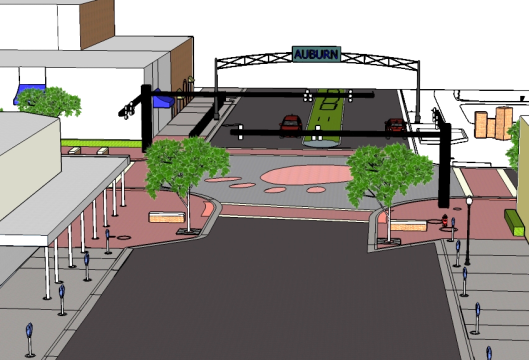 In fact, of all the elements—an elevated intersection, more open design, new traffic signals, pedestrian crosswalks—that could be included in the city’s ultimate contribution to Toomer’s 2.0, Cowper says the arch idea is the most expendable if budgetary complications by the time construction is scheduled to begin (in 2015). The budget for the project is $1 million. “I would doubt that we will have sufficient funding to do everything that the renderings and concepts are showing,” Cowper says. Cowper’s not even sure the thing can be built. Is the light green? Red? Will Chick-fil-A be able to get their food shipment? Do we even have the money? War Eagle? So you’re telling me there’s a decent chance that when everything is said and done there won’t be an arch at Toomer’s Corner? Related: Before and After illustrations from City of Auburn’s Downtown Master Plan meeting reveal possible look for the hip Auburn of Tomorrow.